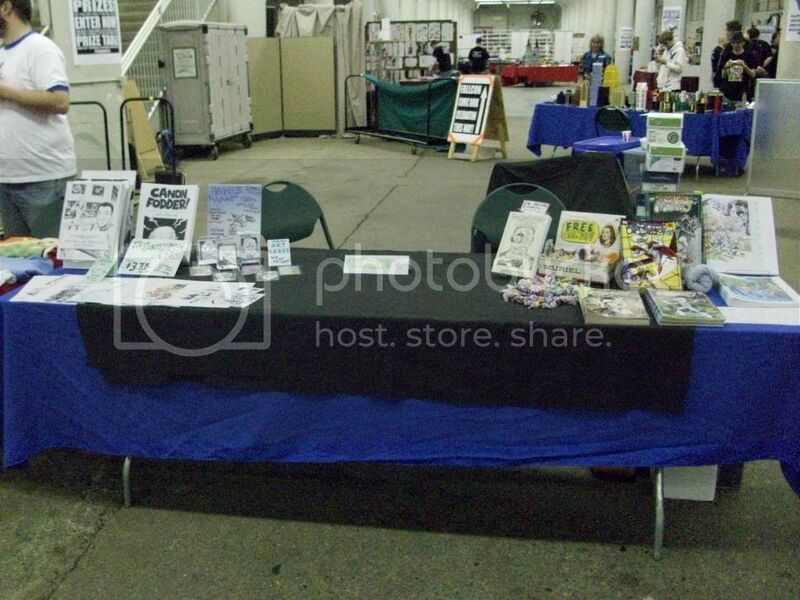 OK, so I missed posting any report of last year's MCBA FallCon in St. Paul, Minnesota. "No big deal," I thought, "I'll just roll it into 2010's report." Little did I know at the time that 2009 marked the end of FallCon as we've known it! In an attempt to vie for greater crowds and to entice more "big-name" guests, the good folks that comprise the MCBA bit the bullet and moved their big two-day convention to May, replacing their Mini-Con ("FallCon" will continue as the regional one-day show). Now, just to set up my report of attending the first ever SpringCon, I have to try to give you at least a quick synopsis of the last ever real FallCon. In brief, my wife wasn't feeling well, so my Dad came with me. We had great "booth buddies;" the gang from Transylvania TV on one side, and cartoonist Scott Gallatin on the other. We saw lots of old friends, made new ones, etc. and so forth. 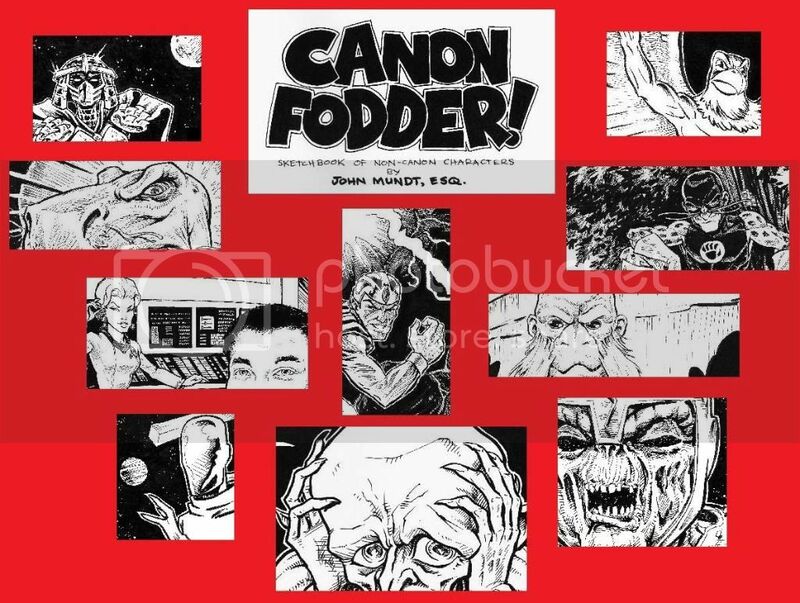 I also debuted my first ever "for sale" sketchbook, Canon Fodder! For SpringCon, held May 15th and 16th, The WOMP Staff was back by my side as we set up the WOMP table for the first time in 2010. We had a great spot (just four tables from the entrance area) amongst some great people. More about them, and other nifty stuff, when my report continues...TOMORROW! Until then, let me get another once-familiar feature back on track. It's been so long since I have posted an "...Of The Day" that I had to do research just to find out what I last did. As it turns out, I was focusing on superpowers. So, after much delay, here is your Comic Book Superpower of The Day - Possession (as in "He's possessed!")! Welcome back, welcome back, welcome back." ...to that same old place that I laughed about, no less. Thanks! Glad you're posting on LJ again! Thanks! Oh, and "SpringCon" doesn't have the same connotations that FallCon had/has (it was originally named after Falcon Heights...in fact, I seem to remember a falcon mascot of some sort in the early years). Thanks, Mr. A! Maybe this Summer you can join me in getting back on the blog-horse, too! Wow, a character I created is in your sketchbook! Cool! Yup! That's why I asked all of those questions about Frargran a while back. He's actually on the front cover!